The first thing to say about my very small attempt to farm garden snails for culinary purposes is that its been controversial. “It’s worse than the live crabs in the sink incident“, Jenny said, “but not as bad as the pig’s head in the fridge.” Personally, I think it’s far worse than the pig head incident…I didn’t have to kill the pig, after all. This little experiment seemed to catch the imagination, provoking reactions ranging from horror to intrigue, long facebook conversations about the ethics of eating things like snails, and the formation of an official pressure group, the Snail Liberation Front, bent on saving said snails from the pot. Like many other pressure groups, it failed, but it did produce some hastily-pushed-through-our-door posters with remarkably good drawings of snails and the epic strap line “only Tories eat snails”, which I must admit made me pause for a moment and consider releasing my prey. All snails in Britain are edible. They’re essentially the same creatures that the French , Spanish and Italians devour by the tonne. The small, colourful ones aren’t worth the bother, and Roman snail, predominant in the South and South West are protected, so that leaves helix aspersa, the common garden snail. It’s not as large as the farmed French varieties, but it’s a reasonable size for eating, and extremely plentiful, as anybody with an allotment will know. If you set aside the emotion of it all, it makes perfect sense to eat snails. Why kill them with poison or the sharp edge of a spade when you can use them properly, for food? It’s a far more ethical and sustainable approach. It make s perfect, logical sense, but there’s a cultural angle to the whole act of eating a snail that simply revolts many British people, which is a shame, because snails are very good to eat indeed. The French know this already, of course. The best time to catch snails is after a downpour. At this time of year, the conditions are perfect – the humidity and dampness draws the little blighters out from under their rocks and out of their cracks and into the open at dusk. A quick shower, a mild evening, a bucket and a strong torch are all you’ll need for a bountiful hunt. Snails need to be prepared quite thoroughly before they’re ready to cook. You don’t know where they’ve been and what they’ve been eating, so you need to change that by controlling their diet for a few days. Put the snails into a container of some sort – a wicker basket of some sort, or something equally breathable is ideal – along with a carrot, and cover the container with something suitably heavy and snail proof. A roofing slate or something like that would be ideal. Put the container somewhere shady, out of the sun. The next day, rinse the snails and the container with cold water to clean away any…droppings. Replace the carrot and cover again. Repeat this cleaning process for at least four days, by which time, the diet of carrot should be very evident from the colour of the snail’s waste product…it should be orange. At this stage, you can be confident that you know what’s in the snail’s stomachs, but you don’t want to eat that. Time to get it out. Remove the carrot, but continue the daily rinsing routine. Do this for a further three or four days, to purge the snails of all waste products and to make sure that they’re very clean. Just before you start to cook them, give the snails a final bath in plenty of water in a bucket, to make sure that all grit is removed from their shells. Put the cleaned snails into a bowl, cover with a plate and place in the fridge for half an hour – the cold forces the snails to retract into their shells and puts them into a deep sleep. Cooking is easy. Make a court bouillon, a simple vegetable stock flavoured with herbs, carrot, celery, onion and whatever else you’ve got in the fridge, and bring it to a rolling boil. The snails simply go straight into the pot. The heat kills them straight away, in the same way it does a mussel. Cook for about fifteen minutes, making sure that the stock stays at just under boiling point. Fish the cooked snails out with a slotted spoon and let them cool for a while before using a pin or a pair of tweezers to drag the flesh out of the shells. It will come out quite easily once you get hold of it. 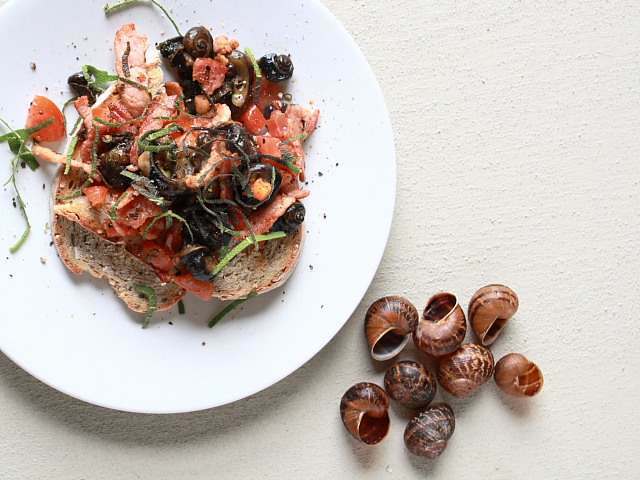 The traditional French way of preparing snails is to stuff the snail back into its shell with a drop of stock and a lot of garlic butter, roasting in the oven for about ten minutes, but I served mine on toast, with crisp bacon, tomato and sage. Does the thought of eating garden snails repulse you, or is it something that you’d dare to try? I agree, it’s a far more ethical and sustainable approach to garden pest management, as well as a perfectly acceptable food source…however I must admit the idea of catching and killing my own is just one gastropod too far for me, strange considering I have no problem with the more conventional game available to the countryside dweller! awesome post! definitely more ethical than killing and not using them for anything. I feel like I would develop an attachment to them through cleaning their systems for those days, but then again, they are snails! Only a non-gardener can be this soppy about snails and slugs. I cannot think of anything worse than waste my time cleaning, let alone eating these most disgusting and much disliked creatures. What I need to know is a method of getting rid of them for ever!!!! This is so amazing! My mother-in-law is full of snails in her garden in Belgium! They are so good cooked in garlic butter…YUM! This is really interesting, but nope, I couldn’t face eating them. I’ve seen my slug trap full and the thought of eating them is unpleasant. To my mind they are best chucked over the garden wall, or left for the birds to eat! Judy, what is ‘disgusting’ about snails exactly? The fact that they eat your plants? Or is it because they’re slimey? Makes you sound like a pathetic child. It’s ironic when people terms like that to describe certain animals when humans are the most vile, destructive and disgusting species to ever exist. Anyway, I’m a gardener and I have no problem with snails or slugs. Yes, they can be annoying, but they are also an essential part of the food chain. I also have no problem with eating them – plenty of other animals do. I admire your stance – I think it’s a great way to make the most of the natural things around us. We walked back from the train station the other night after it’d been raining and they were everywhere, it was like playing hopscotch! We were jumping down the street trying to avoid “the crunch”. I just can’t fancy them myself – I’m not an avid mussel fan either, there’s something about the texture I can’t handle. Good job getting your kids to eat them though! I retired to France a few years ago. My friends make nettle soup, cook locally hunted deer and wild boar, and locally caught frogs’ legs, but don’t grow their own snails, although we have a snail farm nearby. Plenty of large snails in our garden and the village’s forest so I may have a go. I had been led to believe that you had to cook snails several times and skim off horrible deposits, but this sounds much easier than I have been led to believe. Other local recipes include vin de noix (using whole walnuts including outer fruit) which tastes rather like a cream sherry, merisier (made from cherry tree leaves) and various dishes involving sorrel and cow parsley which are absolutely delicious. Family here and in UK have adopted the local custom of immersing surplus fruit in alcohol (sold as “bottling alcohol” here but cheap vodka works just as well) which I can highly recommend. Strawberries retain texture, colour and flavour literally for years, although the favourite is morello cherries, eaten after a meal with local moonshine made from plums. Sadly most recipes in our part of France involve cheese and alcohol which suits us completely but may not appeal to all. Howdy, y’all. I am from the Pacific Northwest USA where we have Helix aspersa all over in our gardens, and in theory they are a close cousin to the more well known French variety. So seeing that I can eat them I am going to catch 20 or so for a short batch and do the whole feeding, cleaning, and cooking ting to see how it turns out. Having just collected a small bucket of beautful snails from my pretty wild garden so I was very happy to read all your info and can’t wait to get started. Imake nettle, sorrel and ground elder soup which is lovely and various wild pestos. Enough of me …snails coming up. Hi, I’ve prepared and just cooks my first dozen snail. I’m just concerned that some have a bright green stripe on them! Its not slime, and on 4 of them, any ideas please? Mike, I’ve no idea, and on that basis, I’d follow the old cook’s maxim of ‘if in doubt, chuck it out’ and play safe. 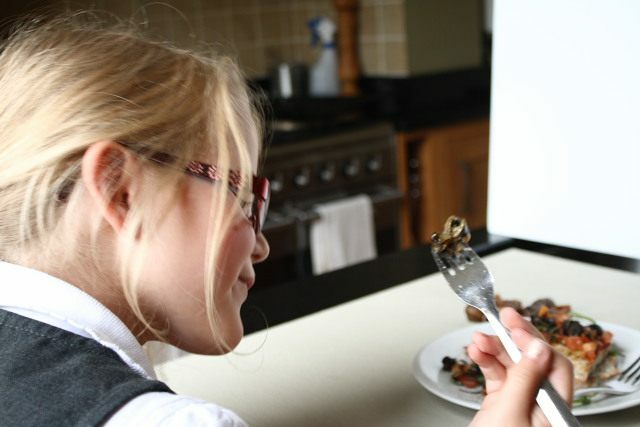 I have always eaten French snails and bought them in a can and loved it! But I have come to China and when they cook snails they are still in the shell and when I get them out and eat them there is some crunchy stuff inside them, which is kind of a turn off. What is it? It’s likely to be grit – I’d suspect they haven’t been starved to purge them properly. Ok, so after picking up 17 snails while gardening last weekend, I decided to follow this guide to cook them, having done it before once and forgotten how but remembered I liked the taste. All went well up until the fridge section. I put the 17 snails in a bowl in the fridge (while the thermometer read at ~1’C) for, in the end, 2:45 minutes, and they still weren’t in their shells! They were mooching around the bowl, cold to the touch but still active. So I put them in a plastic bag in the freezer for 15 minutes. They were still and curled up into their shells by then – not completely, but their heads definitely were. I then boiled them in chicken stock+garlic+sage for 12-15 minutes. After taking them out with a slotted spoon I ran them under cold water to wash off the mucus+etc. This did make them immediately handleable, but also pretty cold by the time I’d fished them out and was eating them (I didn’t roast them or pair them with anything). The stock emphasised the earthy nature of their taste, and I can see why you’d have them with bacon. I have thousands on my garden , I collect a bucket full at a time when it is raining , I have no idea how to stop them from come , it’s like the plague , does anyone know how to get rid of them . Beer. They love beer. Buy some cheap supermarket lager, and bury a container or two so that it’s level with the surface, fill with the beer and watch the slugs and snails drown away. how to get rid of snails – the answer is in the thread – you cook them ?? Snails taste like pulled pork cooked in butter and garlic. Ultra-Fresh, Organic, Nutritious and absolutely Gratis Gourmet Delight literally at one’s doorstep. Super Fast (cook-time) Slow-Food…Thank you for the precise instruction and witty background information to help transform a Pest on to a Plate…Thoroughly relished mine à la française. Thanks so much for the very comprehensive webpage. It’s wet in Devon today, so I’ve just been out with a torch and a bucket, and am buying a carrot as soon as the shops open tomorrow! The little munchkins are in the utility room, no doubt wondering what their fate will be. Whatever it is I’m hoping it will be a tasty one… Will report back in a week’s time. Interesting. At the rate that the human race is increasing we may eventually be forced to eat such things as snails, and small invertebrates to survive. It is logical I suppose, because they breed very fast. At present however, I collect snails in buckets and let them go in the fields about 100 yards away. If you only take them about 30 yards or so they come back. I have proved it by marking them. Well,it’s either my mint,garlic,lemongrass,cyclamens etc etc or the snails. I used to collect them carefully and place them into my neighbour’ s uncultivated yard but now he has fitted it with paving slabs. I collected the newest generation and placed them on the paving slabs where they will die a slow death. Well Emi, do let us know how it goes, and if the recipe is particularly good please do share it! !